Eyeglasses have become commonplace in the styling diaspora these days. But the amazing eyeglasses that you see around yourself is the culmination of a serious of sophisticated designing and manufacturing processes. To get an appreciable understanding about eyeglasses, let us look at some basic steps that are incorporated to make an eyeglass. Eyeglasses are made with different materials, each having its own unique features and strength. The most commonly used materials are plastic, flexon, stainless steel, beryllium, monel and zyl. If you’re looking something cost effective and light weight, zyl (zylonite) is the material you should consider. It is most widely used for light frames of sunglasses, aviators. Monel or mixture of metals, is also used for manufacturing eyeglasses. Monel frames are known for its malleability, strength, corrosion resistance. Titanium is popular material used for manufacturing eyeglasses. Titanium or beta-titanium produce cool variety of eyeglasses with a hint of color. Frames made with titanium are strong, durable, corrosion resistive and flexible. Metals or a type of plastic called cellulose-acetate is generally used in making eyeglass frames. Plastic frames are getting more and more popular with the passing of time. Cellulose acetate is acquired from cotton fibre and has strong and flexible characteristics. It is fabricated in the form of elongated sheets which are marginally thicker than eyeglass frames. Eyeglasses manufacturers have the option of conducting the designing process in-house or outsource it to designing consultants. These consultants generally have a background in fashion designing, who provide valuable insights and perspective from their experience and observed fashion trends. Some designers happen to have a considerable brand of their own. Hence, their name and label is of vital importance for selling the eyeglass frames, particularly amongst the fashion-conscious customers and the younger generation. 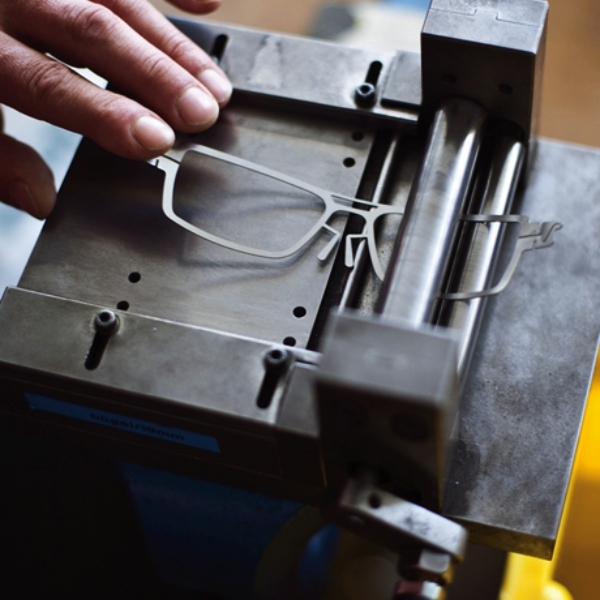 Designers have a wide array of options while creating an eyeglass frame. These options are influenced by the existing fashion trends, market segment being targeted and age of the customer under focus. Accordingly designing parameters are moulded to suit a particular set of customers. Some common designing categories include thick or thin frames, traditional or hipster styles, frame shapes, special frames for children and the older population etc. The eye size and the bridge size also has to be taken into account. 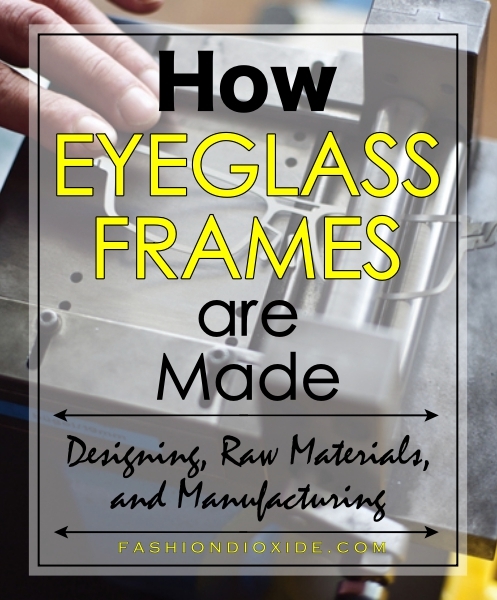 Well, I can guarantee you that after reading all about the eyeglasss frames, you will definitely need a few more interesting facts about wigs and its manufacturing! Once the design has been finalized, a die constructed out of steel is fitted in the blanking machine which punches the sheets of cellulose-acetate. Rods are fitted in the dies which help in removing the punched fronts wherein the lenses will be placed. The plastic is softened by heating it to about 70° C in small ovens. After the plastic has softened to a considerable extent, it is placed in a blanking machine, where the die produces a blank. This process is conducted throughout the sheet so that blanks are produced quickly while the plastic remains soft. The lens blanks are generally scrap and are sold to the recycling industry for recovering costs. Finishing operations are conducted on the blank frame fronts. Grooving is done to hold the lenses in place. For effective grooming, holding fixtures made up of aluminium are used. Industry standard measurements are used for cutting the groove. Thicker lenses require a more sophisticated grooving approach. Abrasion procedure is carried out to smoothen the complete frame and make the frame free from rough edges. This is particularly important in areas where the frame rests on the cheek and around the nose. Two different abrasion machines are employed for the mentioned areas. Gluing of the nose pads to the frame is also done at this stage. After the glue has set, these areas are further smoothened to remove small irregularities in these areas. After the frames, the focus now turns towards the temples. The temples are the side arms that hold the eyeglass to your nose. These temples are also punched out from the plastic sheets. Different styling options are also available while manufacturing these temples. The temples are softened by heating them. Simultaneously, metallic core wires are inserted at the center of these softened temples to provide them with a sturdy backbone. It isn’t mandatory to use core wires, but they are used in glasses which require more durability. But using core wires also makes them expensive. Slotting is done at the corners of the frame to connect the temples with the frame. Hinges are fitted in these slots. A capitron machine is used to melt the plastic of the frame around the hinge, which causes chemical bonding between them. This procedure is more permanent than gluing or other types of connecting procedures. The frame is tilted slightly inward before the temples are connected to the frame. 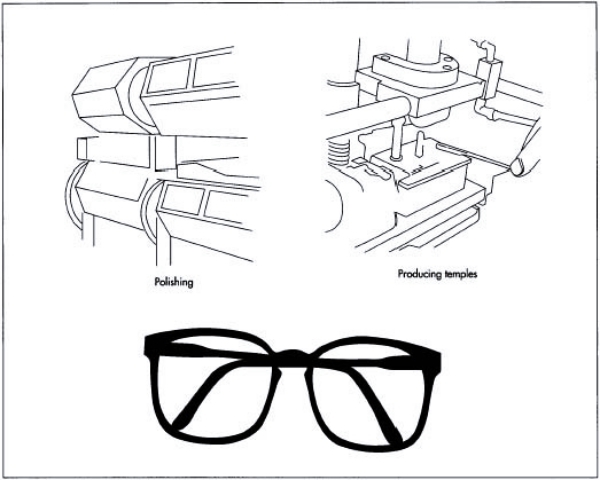 Different labels and the technical details of the eyeglasses are imprinted at this stage of manufacturing. Metallic caps are fitted on the hinges and polishing of the frontal part is carried out. Automatic saw is employed to cut the proper angles in the upper edges. Polishing is done efficiently by putting all the fronts in a drum at the same time. These drums contain pumice which acts as an abrasive. It smoothens the rough edges and imparts the eyeglasses its sleek nature. After the smoothing is achieved, the frames are placed in a die and pressed for about 30 seconds to achieve the appropriate shaping. After the pressing, it is dipped in cold water to harden the entire structure. Tumbling drums are used through which these fronts pass for achieving the required sheen and finish. Inspection is also done at this stage. Finally, all the frames which pass the quality check are sorted according to the style, size and colour. Not only eyeglass frames, also read all about the manufacturing technique of a lipstick.